Hardcover, 9 x 11 in. / 240 pgs / 150 color. Text by Anna Maria Maetzke. 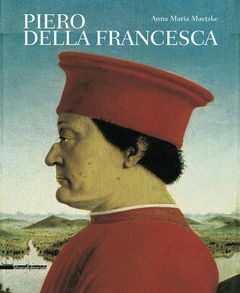 Widely considered the central figure of fifteenth-century painting, Piero della Francesca is also the most modern of all Renaissance painters. To our post-Cubist eyes, Piero’s most famous work, his fresco cycle “The Legend of the True Cross” at Arezzo in Tuscany, conjures nothing so much as Cézanne’s Mont Sainte-Victoire paintings; his serene articulations of architecture and perspective bring other modern traditions and painters to mind, such as Giorgio de Chirico. But it was Philip Guston--a major exponent of Piero in the twentieth century--who most eloquently identified what magnetizes us in Piero: “A different fervor, grave and delicate, moves in the daylight of his pictures. Without our familiar passions, he is like a visitor to earth, reflecting on distances, gravity and positions of essential forms.” Piero’s exquisitely subtle palette has meant that he has not been well served by past monographs, which have been scant enough: the last two major overviews, by Ronald Lightbown and Carlo Bertelli, were both published in 1992. This new monograph, benefiting from subsequent advances in color reproduction, therefore constitutes the first in 20 years. Its 150 color plates reproduce all of his works, from the classic “Baptism of Christ” (1450) at the National Gallery in London to the astounding frescos done for Sigismundo Malatesta at the Tempio Malatestiano in Rimini. Particular focus is given to the “Legend of the True Cross” fresco cycle at the Basilica of St. Francis in Arezzo. Piero della Francesca (1415–1492) was born in the town of Borgo Santo Sepolcro in Tuscany, where, in 1442, he was commissioned to paint the altarpiece of the town’s church. Two years later he was at work on Malatesta’s legendary Tempio in Rimini (where he may have first met Leon Battista Alberti). In 1485 he authored a famous treatise on geometry, and in his last years went blind. Featured detail is reproduced from Piero della Francesca. FORMAT: Hbk, 9 x 11 in. / 240 pgs / 150 color.